Anyone know whether these C8 drop-ins work with any other brands besides Kaidomain? I’ve got a Thorfire C8, Thorfire C8s, Convoy C8 and a generic C8 (I think it’s an Ultrafire clone). I would think it would be most likely to work in the ultrafire. I have several of these pills, we could compare measurements. I do not have a metric pitch gauge. Possible except for the Convoy C8. Don't have a ThorFire C8 but have several generic brands, and found these pills to fit some of them. It's a lot of hit n' miss. I used to be known as the "C8 guy" (then the "Super Shocker" guy) here a ways back . Had a lot of variety of them, lots of mods back before our own FET drivers. Kaidomain, after several years, even though they seemed to have been asleep for a while, are still selling some good original own stuff, a variety of leds that are not seen anywhere else, really good drop-ins, own drivers, flashlights with a good choice of emitters, many many types and sizes lenses, reflectors and other optics. Nice! All I know is I have at least 15 C8’s of many makes and these pills didn’t fit any of them. Only fit my one KD C12, but not the other one which was only 8 months older than the new one and was also a KD model. I used the driver on another light and pulled the XPL HI for another light. Still a good deal, just wish the brass pill could be put to use in other lights. For the $10 risk, I think I’ll pass. If I’m going to throw away money, I’d rather pick up another Ganzo knife that-I-don’t-need rather than a pill that might-not-work-and-I-don’t-need. Thanks for your interesting with KD C8. There are many different C8 products in the market. As you know, C8 has a very long history. It has many different variation, generation. For the KD C8, it is a standard C8 version. I will list the measurement for this pill. You can know more that it is supporting to your own C8 or not. This pill is better used with the Lens with 2mm thickness. Thanks for the heads up on fitting the UF-T20. Just got done doing the swap, retaining ring on the lens was a bear to get loose but after that it was easy. I left the shorter spring on the KD drop in intact, now the light will accept longer batteries without a fuss and still runs shorter unprotected cells as well. What do estimate the throw/lux to be after this swap? My UF-T20 with dedomed XP-G2 R4 (yes, that was a long time ago), did 108kcd (at 2.95A). The newest bin is S4, which is 26% brighter, so that would throw 136 kcd. The XP-L Hi has a die size 2.2 times bigger, with the same current and output the throw could be 62kcd. But bigger dies project relatively well in aspherics (the poor lens quality is more forgiving towards them), and the bigger die XP-L has a bit better output at 3amps and thermal management, so a rough guess could be 80kcd. Cree XP-E2 Red / Green / Blue P60 Drop-in available in KD. And there is some solder on base plate. You can take a look on these. Looks interesting. Will be great to see some flashlights based on these LEDs. 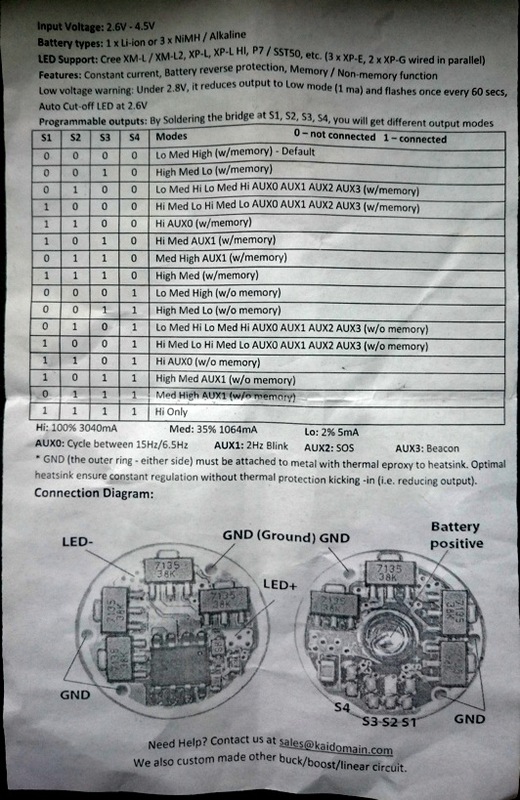 A 3 x LED model with Multiple batteries may be the answer here as the forward voltage is high. We are now released a new version of KDLIGHT 7135 Driver board. Also, we had introduced a new brand KDLIGHT. We would continue to offer the product with good quality and high Price–performance ratio. If you have any comment on our product, please don’t hesitate to contact us. Looks like a great driver with lots of options. Thanks! Looks like a nice regulated driver! But a steel spring… really? This is not Steel Spring. This spring is brass material with silver coated. The spring wire size is 0.7mm. Last night I ordered one of the KDlight V3 8×7135 drivers. I like the added reverse polarity protection and how it deals with low voltage. The mode spacing is good and unlike the Qlite you can choose for no memory, which is essential for me. If it works as it sounds, it is going to serve in a mellow XP-G3 high CRI triple build. Hey BanL, thanks for the reply… Guess I will need to order a couple! The specs look great, I like regulated drivers in many of my EDC lights. Which is the new KDlight? Also will you get more cheap C8 hosts ? (like the old with red leds , they were great hosts). I really like the KD C8’s as well, good selection of parts for them as well. Thanks for your interesting with the new driver board. The PWM frequency is 15000hz. We will update the new product desc asap. We have re-designed the new reflector for the XP-L HI LED . Some beamshots would be superb! Well heck, I am going to have to order another reflector and pill and try the XP-L HI now that it is optimized! I have several of their C8’s, not as clean as Convoy but very functional! I got the driver in and without having tried it I’m impressed by the number of settings (my favorite low-med-high-without-memory can be chosen, unlike intl-outdoor’s qlite) and by the good connection between batt+ and led+ . The 7135 chips are branded and look the same as Mtn El. uses. Good to hear that the PWM is unvisibly high. One more question: the manual speaks about thermal protection (output step-down) which is a great feature, but I know that the Attiny13 MCU does not support temperature sensing. 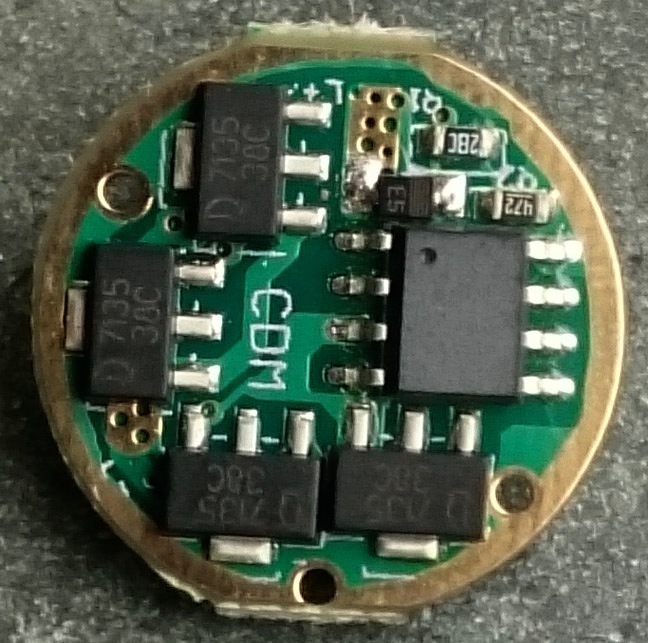 This MCU has its branding sanded off, but is it the Attiny25 or the like that does have temperature sensing?